"I wanted to make sure every single one of them is in some way remembered." 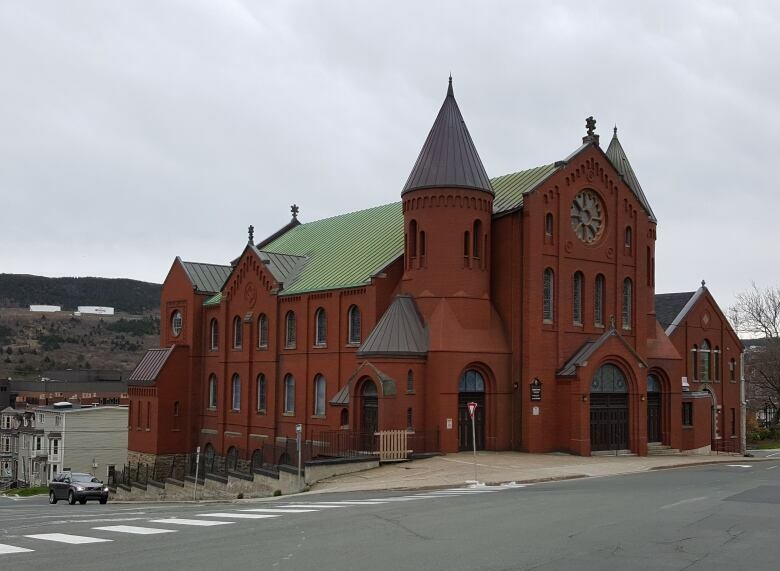 While honouring the sacrifice of the people who fought in the First World War is front and centre this Nov. 11, one St. John's church has been quietly shining its own spotlight on the brave men and women of the era. 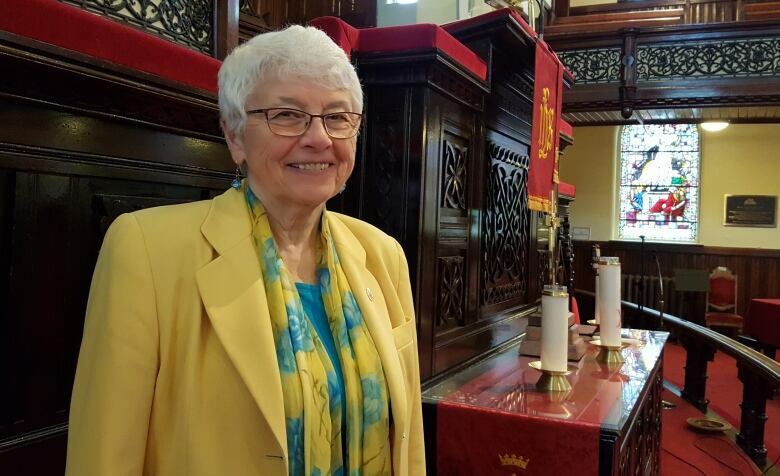 Gower Remembers is a project spearheaded by Gower Street United Church in which members of the congregation who served from 1914-1918 are profiled. So far, 84 people have been honoured — the first profile was presented Nov 16, 2014 — and more profiles are on the way. Bert Riggs is the one who launched the initiative. 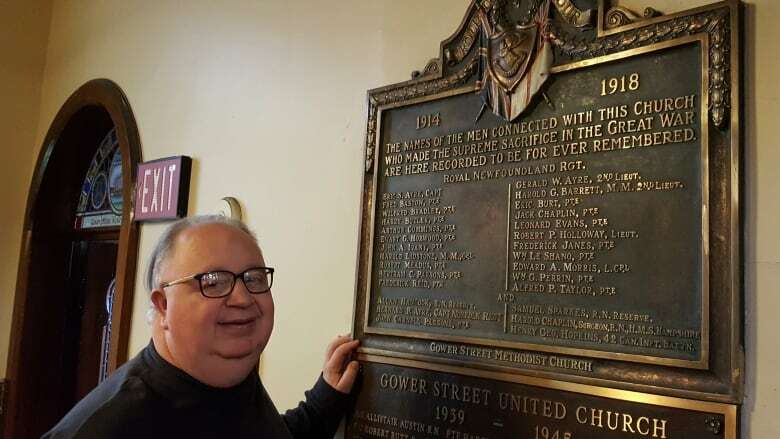 "I believe every single one of the 6,000-plus members of the Newfoundland Regiment have a story to tell," said Riggs, a parishioner at the church for five years and a retired head of archives and special collections at Memorial University. "Some of those stories end quickly on the battlefield of Europe or at the bottom of the ocean. Others came back and and didn't tell their stories, a few others came back and did … and I wanted to make sure every single one of them is in some way remembered." A bronze memorial plaque on the wall next to the altar lists the names of 28 men — members of the congregation who were in the Royal Newfoundland Regiment, or other army regiments or naval services — who were killed or died as a result of injuries or illness stemming from the war. "Every Sunday, you glance up and there's the memorial board … and I knew that there were more besides that," said Riggs. After getting the go-ahead for the project from the church, Riggs crafted the first profile of Lt.-Col. Cluny Macpherson, a doctor who invented a gas mask widely used by Allied troops. A pamphlet featuring his biography was inserted in the church bulletin, and Riggs spoke briefly during the service that Sunday to introduce the project to parishioners and draw their attention to the printed profile. "I thought, 'What a unique idea,'" said Rev. Marion Davis, who returned as a temporary minister at the church 2017. "The people in the congregation seem to appreciate the story that [Riggs] offers, twice a month, usually. It brings to life not only the names that are on this plaque, but the names that are in memories." To create the profiles, Riggs scours directories, newspapers and journals, and taps into a variety of library and archives databases. "I've tried to find all the members of this congregation, no matter what service they were in, " he said. "There were several with the Royal Flying Corps. There were ones in the navy. They were in the Canadian army, various regiments within the British army, and some of the women were in the American Red Cross that went overseas as a nursing unit." Riggs also reached out to the relatives of those former members of the congregation, within the city, across the province and around the world. When they learned about the project, many provided photos and biographical information. His list grew from 28 names to about 150. "That has given an incredible personal touch to it," Riggs said. Riggs has spoken to people who are still part of the church's congregation about their relatives, including a woman in Ontario who sent a telegram to be read in church on the Sunday her great-great uncle was profiled. Another woman flew from Ontario to St. John's to attend the service when her uncle was commemorated. Ruth Pitt Francis has a personal connection to the project — her grandfather was Sgt. Wilfred James Woolfrey, originally from Lewisporte. He enlisted in the Newfoundland Regiment and was awarded the Military Medal for bravery. After the war, he became a minister and served at the church. Pitt Francis was in church two years ago when her grandfather was profiled. "It was wonderful … to just remember him as a person," she said. "I think it's a wonderful thing to remember all these people who gave their lives. And even if they didn't give their lives, they served their country." Carl Wright is also grateful for the project. His great uncle, Pte. Lester Densmore Barbour, was originally from Newtown, Bonavista Bay. He attended the church on Gower Street when he came to St. John's to go to school. He enlisted in the Newfoundland Regiment and was killed in 1918. Barbour was also profiled one Sunday, something that touched Wright. "He's not forgotten. His memory lives on," he said. "He's a very, very important part of our family." Riggs said there are about 65 more people to profile, so the Gower Remembers commemorative project will likely continue for at least another year. After that, the biographies will be compiled in a book. "I'm really proud that we're doing this," he said. 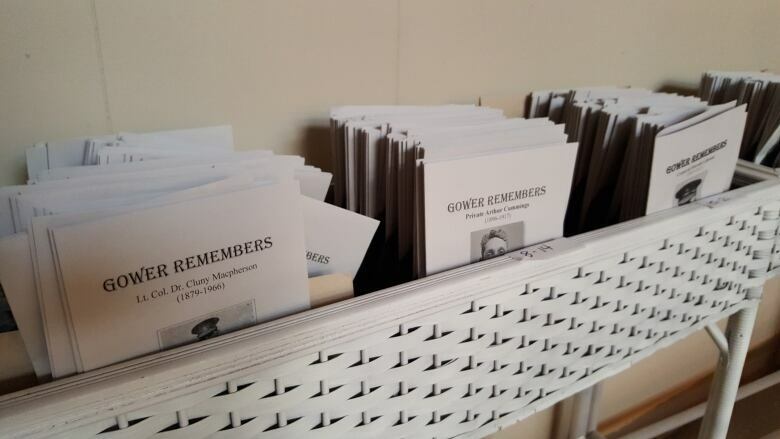 Listen to Christine Davies' documentary about Gower Remembers right here.